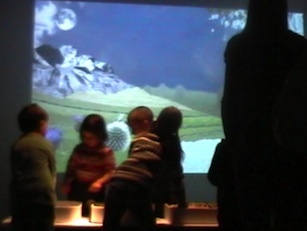 Read more about Interactive Playground on the WRO Art Center website. Textures (Faktury) invites children and adult audience to create discover story hidden inside interactive animation through simple interface build from natural materials like wood, stones and grass. The work breaks troublesome for many media implementation factors such as insulation recipients if the interface is not engaging the body - this work is strongly focused on the body, intuition, natural reactions and expectations.